Donald Trump has sold his entire stake in Energy Transfer Partners (ETP), the company overseeing construction of the controversial Dakota Access Pipeline, a Trump spokeswoman told NBC News. Trump's shares of the company created a possible conflict of interest for the president-elect, as his administration may determine the project's fate amid ongoing protests from Native Americans and climate activists. Trump has supported the 1,172-mile pipeline and broader efforts to produce more fossil fuels in the United States. On Sunday, the Army Corp of Engineers denied a federal permit for the project needed for a segment of the pipeline. Trump's administration could still approve it. The planned pipeline route would have crossed beneath the Missouri River and run a half-mile of the Standing Rock Sioux reservation. 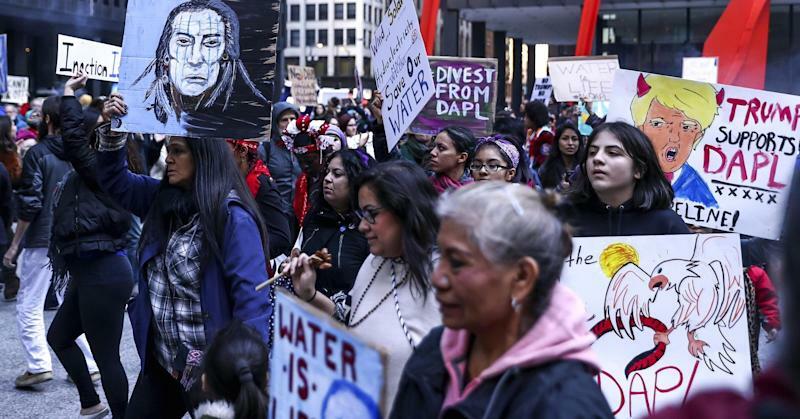 Opponents said it could taint drinking water and disturb sacred sites. Protests against the pipeline have gone on for months. This summer, Trump's most recent financial disclosure form said he owned between $15,000 and $50,000 of Energy Transfer Partners' stock, so the sale must have taken place since then. Trump spokeswoman Hope Hicks did not say if he also sold his shares of Phillips 66, which has a smaller investment in the project. Energy Transfer Partners CEO Kelcy Warren also gave $100,000 to Trump's joint fundraising effort with the Republican Party, according to Federal Election Commission records. However, Hicks said the donation would not affect Trump's decision making when he takes office. Late last month, The Washington Post first reported that Trump sold off his stake.